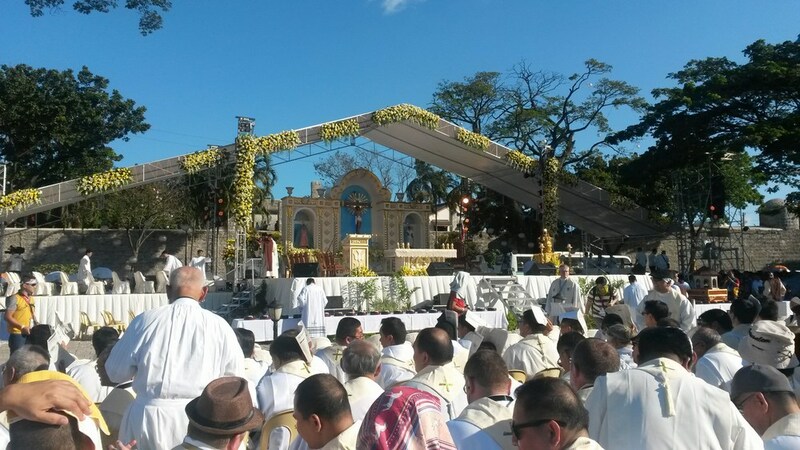 I had the privilege of attending the 51st International Eucharistic Congress in Cebu, an Island in the Philippines from the 24th to the 31st January. 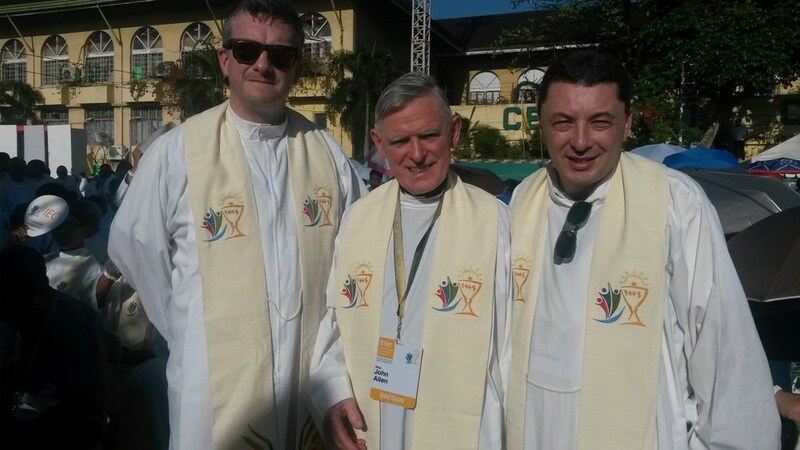 I was part of a group from Ireland who traveled to support the Church in the Philippines as it hosted the International Eucharistic Congress. Having been involved in the preparations and the IEC 2012 in Dublin and witnessed how the Church in Canada supported the Church in Ireland, a few of us from different dioceses in Ireland felt it was important to support the Congress of 2016. From the first moment of stepping onto the land of the Philippines the hospitality and kindness of the Philippine people was very evident. The joy and happiness of the people was contagious, they are a people of joy even in the midst of poverty. It was quite a surprise to see poverty and wealth live side by side. From our hotel you could see what we would call ‘shanty towns’ in the midst of urban development with hotels, high rise buildings and shopping malls. In fact it was somewhat disturbing to witness the poverty of some. Yet the joy and warmth of the people was extra ordinary. The cooperation between the State and the Church in hosting the Congress was very noticeable as was the inculturation of the Church into the Philippine people. “Simply staying put is a sign of hope in the Lord who has promised to be with us until the end of time (Matthew 28.20). Abiding is a sign of our hope in the God who will never go away. We abide with the poor, with people who feel abandoned, with our congregations in tough times, as members of the Church, because God abides with us. Sacraments are signs. They express a hope for what is beyond our words, God’s coming. They point to a fullness of meaning which we can only express in gestures. A sacramental people should find creative gestures which express our hope. (Timothy Radcliffe OP- The Christian Virtue of Hope). Cardinal Bo – the Papal Legate reminded us that the Eucharist calls us to recognise one another as the brothers and sisters and the mission it gives us, to stand up for life. “Adoring Jesus in the Eucharist is also accepting our fellow men and women as created in the image of God. In a world that kills children in the womb, a world that spends more on arms than on food, in a world that continues to have millions of poor, Eucharist is a major challenge to the whole humanity. Can we feel the presence of God in our brothers and sisters? Pope John Paul talked about the culture of death. Pope Francis spoke of a culture of indifference. Eucharist then, cries out from the womb to tomb of human dignity. Abortion, death penalty, euthanasia, etc. are vital challenges to Eucharist today. Our adoration of Eucharist affirms our unalienable faith in human dignity. Governments and others need to appreciate our faith vision. So millions of Catholics attend Mass and adore the Sacrament. As we gather not only the bread on the altar becomes the body of Christ. Each one of us is joined with our brothers and sisters as one body “We, though many, are one body (1 Cor 10:17). This great awareness brings us to the first great task: Eucharist and Mission.” (Cardinal Bo – opening Mass). “I was misled as a young boy in thinking that I would find happiness and fulfillment in money, fame, travel and women, all of which I was able to achieve but none gave me the desired peace and happiness my heart was searching for. Everything changed when after my Catholic Confirmation at age 21. I found God, which led me to live coherently my Christian calling and actually gave me that desired peace and happiness I was always searching for in the wrong places. I was most surprised to learn that Christ was truly present in the Most Holy Sacrament of the Altar, and that He waited humbly there for me, always. I never learned this as a child. I started to attend daily Mass wherever I was in the world, and needed to be with the Eucharistic Christ at a daily basis. This daily need for the Eucharist became a difficult cross to bear for me when I was performing in a very small town in Japan, that had me do a 3 hour trip to reach Sunday Mass, which in total was 7 hours of my day just for that 1 hour with the Lord in Mass. There were many others who gave testimony to their faith and how important their faith is to them. Others like Cardinal Tagle, Archbishop of Manila, challenged us to live Eucharist by engaging with the culture around us and challenging that culture with the vision of faith we live. “The Eucharist offers an experience of another culture, the culture of convocation, “convocare”, you are called with others. You are called to be with others, and you are called to be with others in a meal that the Lord hosts. When the Lord host a meal, be prepared to be with surprising others. But, in the meal hosted by the Lord, persons recognise a close neighbour, a fellow sinner, a sister, a brother, with a place at the family table. In each one, I see myself, as I see a brother or sister, I also discover myself. Sinful but loved. Undeserving but invited, shamed but embraced, lost but trusted. That was how Jesus hosted and participated in meals by calling together the most unimaginable combination of people to a community to become his family, his Body because he has convoked them. Remember how Jesus broke the isolation of those pushed aside by a culture of alienating individualism, Matthew the tax collector, Zaccheus, the sinful woman who washed the feet of Jesus, the centurion, the syrophoenician woman, and recall the eternal isolation of the rich man who totally ignored the poor man Lazarus. Cardinal Dolan of New York gave a wonderful talk on Mary and the Eucharist and how important Mary is to our faith and how she can lead us closer to her Son. Bishop Barron in recalling the story of Eammus spoke of how the two disciples walked away from Jerusalem, yet Jesus walked with them, he did not abandon them even though they were walking away from all that had happened – this show us that Jesus does not walk away from us even though we may walk away from him. At the end of the Congress Cardinal Bo, the Papal Legate invited the Philippine People to become missionaries throughout the world, to spread the love of the lord and the love for life. Over one million people took part in the final Mass and over one and a half million people took part in the Eucharistic Procession which was very prayerful and reflective, to witness people coming out on the balconies and to windows of offices with lighted candles, blessing themselves and praying was a moving experience. Archbishop Diarmuid Martin of Dublin celebrated the Mass before the Procession and he spoke of how there can be no Eucharist without the Church, the Eucharist comes to us through the Church and we go to Christ through the Church. Another of the wonderful moments of the Congress was the celebration of First Holy Communion by 5,000 children. 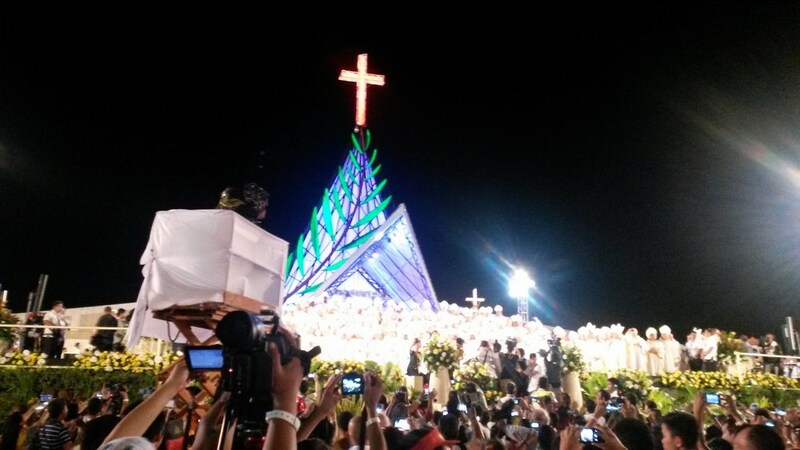 The celebrant of the Mass was Cardinal Vidal, retired Bishop of Cebu. Seventy Nine years previously he had made his First Holy Communion at the International Eucharistic Congress in 1937. Little did he know then that he would become a priest, Bishop and Cardinal and preside over the Mass for First Holy Communion at the next International Eucharistic Congress in 2016 in the Philippines. God has plans for each one of us, all we need to do is to be open to Him and discern his will. Over 13,000 people took part as Delegates at the Congress at various talks, and celebrations. A number of Parishes Hosted a day of hospitality and to the delegates. This was a great celebration of prayer and food and culture. Another example of the Philippine people’s welcome. The Church in the Philippines are preparing for the 500th anniversary of the Catholic Faith coming to the country. They have a plan and theme for each year to continue the work of evangelization. We pray that their faith may continue to grow and help to evangelise other parts of the world today. The 51st International Eucharistic Congress was a tremendous experience of faith, friendship and hospitality. It was a sign of Christian Hope. May the next Eucharistic Congress which will take place in Budapest in 2020 continue to be a sign of Hope to the World. Prayer of the 51st Eucharistic Congress. Lord Jesus Christ, our hope of glory, You are the fulfillment of the Father’s plan to save all humanity. You are the mystery hidden from the ages and from generations past now manifested to us. You abide in your Church in the most holy sacrament of the Eucharist. As we celebrate the Holy Eucharist and receive your Body and Blood, grant us the awareness that your presence in us urges us to continue your saving mission in the world. Send us your Holy Spirit, that he may lead us to walk humbly with the poor and the marginalized, in the company of Mary, your most holy mother and ours. O Lord in the Most Blessed Sacrament, to you be all honour and glory and praise in the unity of the Father and the Holy Spirit. Report by Fr Patrick Winkle, CC Youghal. 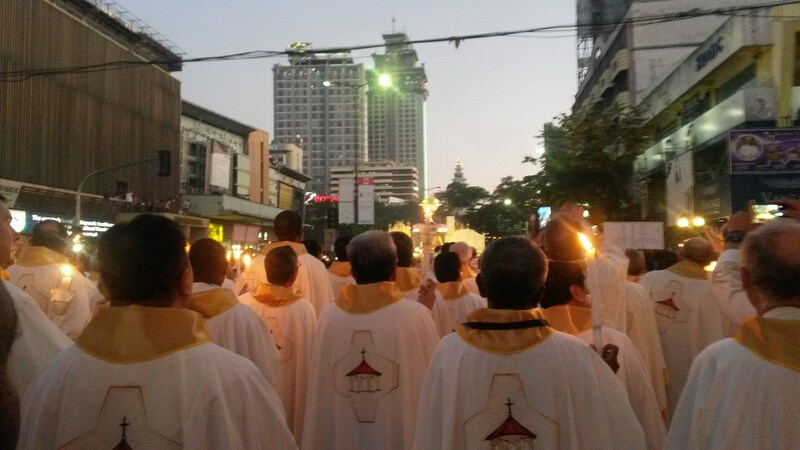 See www.iec2016.ph for talks and homilies of the Congress.